Like Churchill, Thucydides has not been immune from attack upon his historical method and presentation.11 These criticisms are often based upon the charge that Thucydides is not concerned with events themselves, but with seeking behind events some unchanging and eternal truth—some fixed law of human behavior. Herein lies the most instructive of the parallels. There is no reason to think that the lessons Thucydides seeks to glean from history would be classified by him as unchanging rules of human behavior on the level either of metaphysical principles or determinative scientific laws. Rather, the lessons Thucydides sees in history are the probable connections between, character, action, and consequence. The value of history lies in providing examples of human action, presenting to the reader prudential landmarks by which he may be guided through the basically consistent landscape of human existence. Thucydides intends that his work will be a guide to future action. A moral implies a teaching and, what is more, a moral only makes sense if you are able to make choices–choices which are good or bad, right or wrong either simply or given the circumstances. A moral is meant to provide guidance, a way of proceeding in the world—what is, in the author’s understanding, the best way. And, it must be noted, if the moral is meant to provide meaningful guidance for any length of time, it assumes a fundamental stability in the course of human affairs. That Churchill’s categories of human experience revolve around peace and war is not surprising–his whole life was devoted to such questions; and he is, after all, writing the story of a war. But the story Churchill has to tell is not limited in scope to this war, nor is it contained solely in this work. It is to be found also in his speeches, in his other writings, in his career, and in his life. Nor is the moral limited to The Second World War alone. It is intended for human life in general. This intention of Churchill’s finds no surer proof than his own adherence to this guide throughout his own life; indeed, one could not think of words any truer to the essence of the man. The most prominent feature of Churchill’s preface to the first volume of his history of the Second World War is the repetition of his intention that his work should be of service to the future. The variations on the theme of laying “the lessons of the past before the future” sound the somber notes of both remembrance and warning. Churchill regards his telling of the Second World War as but the continuation of the story of the First World War.14 The two tales are halves of a whole. ALLOWED THE WICKED TO REARM. The rebuke is conveyed by the title and the content of the first chapter, “The Follies of the Victors.” Here begins the sad tale of how the hard-won peace was squandered: “After the end of the World War of 1914 there was a deep conviction and almost universal hope that peace would reign in the world. This heart’s desire of all peoples could easily have been gained by steadfastness in righteous convictions, and by reasonable common sense and prudence.”15 Instead, the victors “lived from hand to mouth and from day to day, and from one election to another, until, when scarcely twenty years were out, the dread signal of the Second World War was given…”16 It is not only the remembrance of past agonies that adds the touch of sorrow to Churchill’s words and work, but the reflection that the good are particularly prone to the follies that allow wickedness to take shape and grow again–and that this story has no end in this world. Moved by a historically rich and vivid vision of human life, Churchill did not remain content to survey the events of his own experience, and of his own time. Indeed, the world has seen few men whose imaginary eye was more attuned to the shades and colors of the past, whose view of earlier ages was at once so panoramic and so personal. For the reflective, an intimate walk with history invites contemplation on the human condition as such. Churchill was no exception. His writings on this topic convey the impression of human life as sacrifice and struggle. It is clear that the story of the world wars was, for Churchill, not so much a discrete tale as it was a chapter in the larger story of human existence—a story which has always told mostly of war. Like Thucydides, Churchill sets his subject within the larger story of humanity. It is true that in Churchill’s understanding the stage for World War II was set in the mishandling of the final act of World War I. It is also true that he saw the second war as a culmination of the whole history of man. In various inter-war writings, Churchill gives a kind of mythic account of the beginnings, an echo of the “Archaeology,” as the opening of the Peloponnesian War is known. Mankind has never been in this position before. Without having improved appreciably in virtue or enjoying wiser guidance, it has got into its hands for the first time the tools by which it can unfailingly accomplish its own extermination. That is the point in human destinies to which all the glories and toils of the past have at last led them. They would do well to pause and ponder upon their new responsibilities. Death stands at attention, obedient, expectant, ready to serve, ready to shear away the peoples en masse; ready, if called on, to pulverize, without hope of repair, what is left of civilization. He awaits only the word of command. He awaits it from a frail, bewildered being, long his victim, now–for one occasion only–his Master. Humanity has not improved, Churchill says, except in its ability to destroy. Its self-control has not been augmented along with its destructive power. All of the old spurs to conflict still prick the human breast. The world enjoys but a brief respite, perhaps only a moment of rest, before it plunges back into the flood: “Let it not be thought for a moment that the danger of another explosion in Europe is passed. For the time being the stupor and the collapse which followed the World War ensure a sullen passivity, and the horror of war, its carnage and its tyrannies, has sunk into the soul, has dominated the mind, of every class in every race. But the causes of war have in no way been removed…”19 The exhaustion will pass, the stupor will clear, old horrors will cease to deter; the eyes of man will turn outward again, his inward heart unchanged. Churchill believes that he is writing in that brief moment of opportunity when the exhaustion which still clings to the limbs of Europe offers to the nations “a final chance to control their destinies and avert what may well be a general doom.” It is now that the effort must be made: “Surely if a sense of self-preservation still exists among men, if the will to live resides not merely in individuals or nations but in humanity as a whole, the prevention of the supreme catastrophe ought to be the paramount object of all endeavor.”20 But the effort was not made; it was shirked or went awry. And another war came. Both Thucydides and Churchill participated in the wars they write about. Both authors saw their respective conflicts as great teaching moments because of their scale and what was at stake. 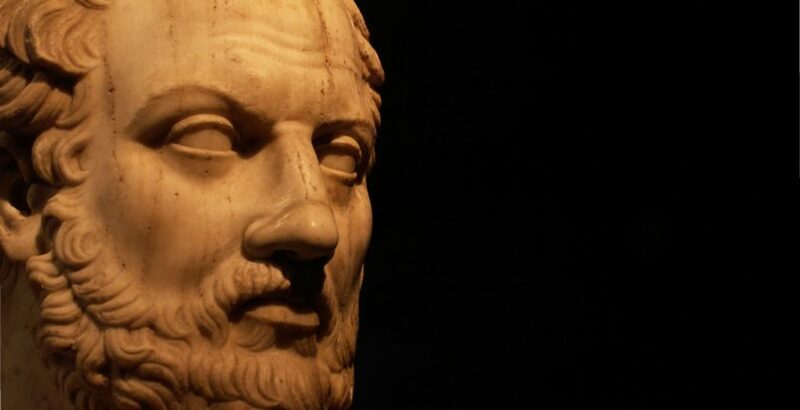 Thucydides’ calls the Peloponnesian War “the greatest movement yet known in history.” This claim involves the assertion that the wars of the past were not so great. The weakness of ancient times did not allow for conflicts to take on the same scale that increased technology and cooperative activity would later allow.21 Yet Churchill makes a similar case for the Second World War. Earlier ages could not measure up to the twentieth century in terms of the powers within humanity’s grasp. Even when reflecting on the moment of triumph, Churchill sounds the grim note of warning. War may come again, he writes. Indeed, it probably will—unless mankind can learn from its mistakes, unless it pays heed to the lessons of the past, lessons which Churchill, in speech and written word throughout his long career, strove to lay before the future. By Churchill’s own telling, the peoples of the world failed to learn the lessons of the First World War and so were condemned to another. But he never took this difficulty as an excuse for giving up. When danger again threatened in the wake of the second war, Churchill again offered counsel, again he tried to convey the lessons of history. Justin D. Lyons is Associate Professor of Political Science at Cedarville University in Ohio, and author of “Churchill on Statesmanship: Pope Innocent XI,” “Churchill, Shakespeare, and Agincourt.” In 2015 he published Alexander the Great and Hernán Cortés: Ambiguous Legacies of Leadership. *Certain reflections herein derive from the author’s “Thucydides, Churchill, and the Writing of Political History,” Citizens and Statesmen, Volume IV (2009), pp. 98-129. 1 Quoted in David Reynolds, In Command of History: Churchill Fighting and Writing The Second World War (Random House, 2005), 7. 2 Maurice Ashley, Churchill as Historian. (New York: Charles Scribner’s Sons, 1968), 69. 3 Ashley, Churchill as Historian, 72. 4 Manfred Weidhorn, Churchill’s Rhetoric and Political Discourse. Exxon Education Foundation Series on Rhetoric and Political Discourse, ed. Kenneth W. Thompson, no. 17. The White Burkett Miller Center of Public Affairs, University of Virginia. (Lanham, Md. : University Press of America, 1987), 9. 5 Martin Gilbert, ed., The Churchill Documents, Vol. 11 (Hillsdale College Press, 2009), 1014. 6 Martin Gilbert, ed., The Churchill Documents, Vol 3 (Hillsdale College Press, 2007), 464-66. 7 Martin Gilbert, ed., The Churchill Documents, Vol. 12 (Hillsdale College Press, 2009), 368. 8 See Richard Langworth, “Churchill and Thucydides, bit.ly/2IBSUO2, 18 July 2012. 9 See Paul A. Rahe, “The River War: Nature’s Provision, Man’s Desire to Prevail, and the Prospects for Peace” in James W. Muller, ed. Churchill as Peacemaker. Woodrow Wilson Center Series. (Woodrow Wilson Center Press and Cambridge University Press, 1997). 10 For a survey of Churchill’s exposure to Thucydides and the Greek historian’s influence on his writing, see Oliver Schelske, “Thucydides as an Educational Text” in Christine Lee and Neville Morley, eds. A Handbook to the Reception of Thucydides (Wiley Blackwell, 2015), 82-90. 11 See, for example, R.G. Collingwood, The Idea of History. (Oxford: Oxford University Press, 1946). 12 Robert Strassler, ed. The Landmark Thucydides. Translated by R. Crawley (Chicago: Free Press, 1996), 16 (1.22). 14 Winston S. Churchill, The Gathering Storm, Vol. I, The Second World War (Boston: Houghton Mifflin Company, 1948), iii: “I must regard these volumes as a continuation of the story of the First World War, which I set out in The World Crisis, The Eastern Front, and The Aftermath. Together, if the present work is completed, they will cover an account of another Thirty Years War.” See Schelske for this and other parallels of presentation and understanding between Thucydides and Churchill. 15 The Gathering Storm, 3. 16 The Gathering Storm, 18. 18 Winston S. Churchill, “Shall We All Commit Suicide?” in James W. Muller, ed. Thoughts and Adventures: Churchill Reflects on Spies, Cartoons, Flying, and the Future (ISI Books, 2009), 259. 19 “Shall We All Commit Suicide?”262. 20 “Shall We All Commit Suicide?” 265. 22 The Gathering Storm, 15-16. 23 The Gathering Storm, 16. 25 The Gathering Storm, 6. 26 Winston S. Churchill, Triumph and Tragedy, Vol. VI , The Second World War (Boston: Houghton Mifflin Company, 1953), ix. 27 The Gathering Storm, iv-v.
28 “Air Parity Lost” May 2, 1935 in in Robert Rhodes James, ed. Winston Churchill: His Complete Speeches 1897-1963. 8 vols. (London: Chelsea House Publishers, 1974), VI 5592.